The Mazda CX-5 is a crossover SUV that is well-known as being a reliable and durable vehicle. The Mazda CX-5 has plenty of storage room and seating. This vehicle has the technology to keep you in control of your driving experience in Brunswick and beyond. The Mazda CX-5 available at Brunswick Mazda is equipped with SKYACTIV® TECHNOLOGY vehicle dynamics and the G-velocity control. These two systems work in conjunction to allow you to steer the vehicle in an efficient manner. This technology allows for tight cornering and responsive steering on all road surfaces and in a variety of weather environments. The systems adjust the overall power delivery of the Mazda CX-5. 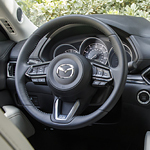 The Mazda CX-5 also improves your driving experience by offering an active driving display. This display projects the vehicle's speed and warning alerts in the windshield area. This allows you to keep your eyes and attention on the road when you are traveling down the highway.